Call Us Today! 518.731.1157 • recover. restore. regain. 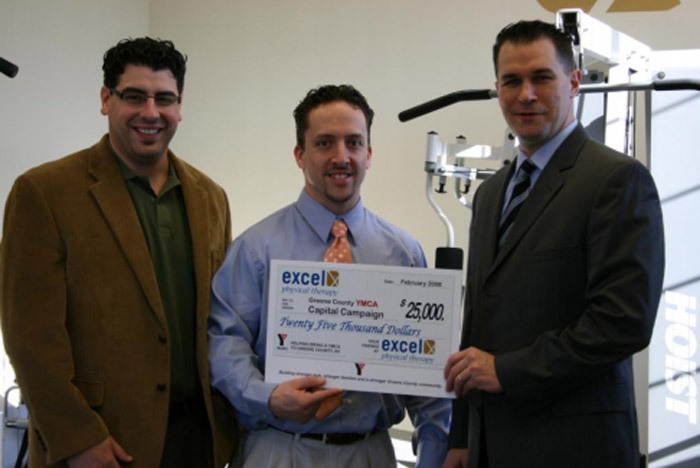 The Capital District YMCA announced a $25,000 contribution designated to the new Greene County YMCA Capital Campaign on Thursday, February 14, 2008 at the Excel Physical Therapy Office located on Route 9W in West Coxsackie. The Capital District YMCA is in the midst of a $5 million campaign to build a Greene County Branch in the community. Excel Physical Therapy provides comprehensive outpatient therapy services to children, adults, and the elderly with the goal of decreasing neuromusculoskeletal, cardiopulmonary, and integumentary impairment to maximize function. Offices are located in Coxsackie, Hudson, and Mechanicville. The YMCA in collaboration with local business and community members look forward to bringing a 40,000 square facility to Greene County. Amenities of the facility will include a Kid’s Corner, wellness areas, an aerobics studio, multi-purpose gymnasium, swimming pool, running track, and a community room. The Greene County YMCA also provides school age child care programming at Coxsackie-Athens Central School District. The Capital District YMCA is a non-profit organization dedicated to the promotion of fitness and healthy lifestyles, strengthened family life, community develop the instilment of leadership qualities in our young people and strengthened international understanding based on Judeo-Christian principles. Get the relief and recovery you need NOW – without a prescription. Tour our facilities and meet our experienced team. Call us today at 518-731-1157 to schedule an appointment or email us anytime! 10 Year Anniversary of Excel Physical Therapy!